Come for the coffee, stay for the experience, introducing 18 Gram’s Afternoon Table Side Coffee Service for Two. Available every afternoon after 2 pm 18 Grams brings the high-tea experience to coffee. Featuring a table-side siphon preparation of Single Origin coffee served with an assortment of the sweet & savory. Our coffee service is relaxing way to catch up up with friends or family. 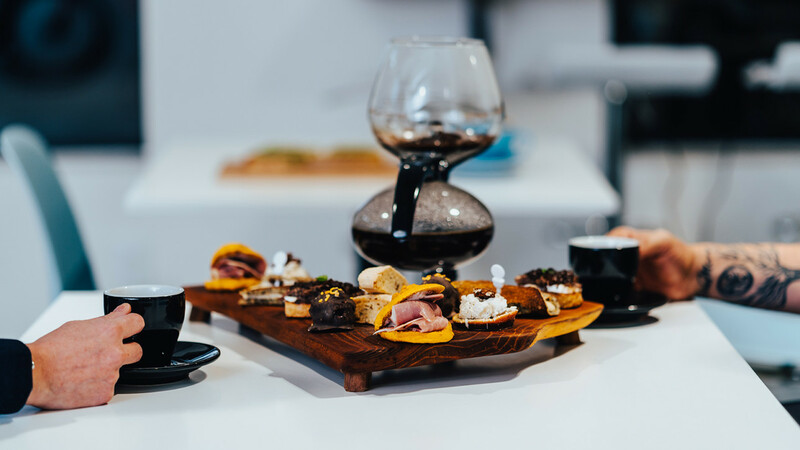 This experience features limited release coffee for two plus a unique assortment of food items. These include a pumpkin rosemary biscuit stuffed with the local and famous Calhoun Country ham & raspberry, horseradish spread, Lamb & Brie open faced slider topped with peach chutney, Lemon Poppy Seed Blini filled with mascarpone creme, candied orange topped with vanilla custard, plus a selection of cake truffles & home made biscotti. This is a limited daily experience so reservations are suggested.